The business terms “Push” and “Pull” originated in the Logistic and Supply Chain Management. Relative to customer demand, supply chain processes are executed, which fall into two broad categories-“Push” and “Pull”. The execution of the Supply Chain process is reactive to customer demand. Then, it is under “Pull” process. If the customer orders are speculative and order execution is initiated based on anticipation, then the Supply Chain process in under “Push” process. The Supply Chain processes start in some cases with research and development, which pushes Production. And Production itself pushes Marketing to create demand. The Supply Chain processes start in other cases with the express market needs, which pushes research and development, which in turn pushes production and production pushes marketing to meet the already expressed demand. B.Long term forecasts drive production and distribution. B.Demand drives production and distribution. C. Response to specific order. D. Unable to meet changed demand. D. Point of Sale data used to know demand. F. Advertising cost may be higher. G. Different type of production batches easy to implement. G. Difficult to implement large production batches. 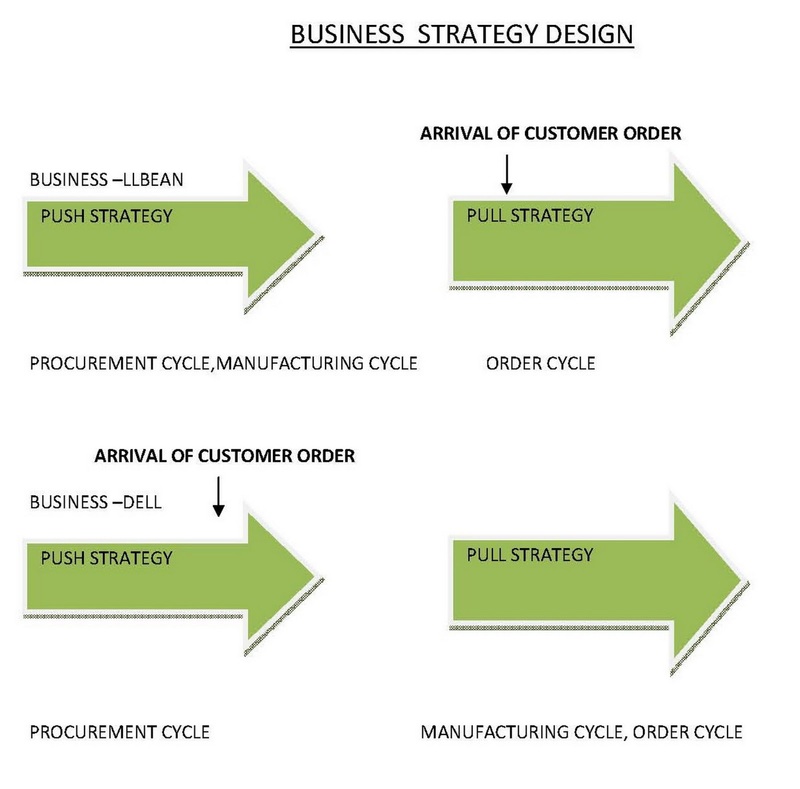 LL Bean executes all processes in the customer order cycle after the customer arrives. All processes in the replenishment cycle are performed in anticipation of demand. For Dell, who is the build to order computer manufacturer, the situation is different. Demand is not filled from finished product inventory but from production. The Push-Pull strategy applied in many Supply Chains.The Textile and Apparel Supply Chain in the current world is considered as a Push-Pull Supply Chain, which is also called a synchronized Supply Chain. 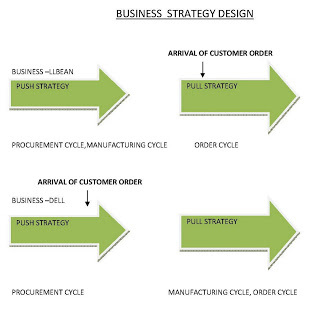 In this strategy, the initial stages of the Supply Chain are based on “Push” strategy, while the final stages are operated on “Pull” system. The interface between push based stages is referred to Push-Pull boundary.In a South Asian textile industry, it has been observed that being a fabric manufacturer they outsource yarn based on a forecast, and weaves as per real customer demand. The “Push” part of their Supply Chain prior to weaving, while “Pull” part starts with weaving, which pushes part starts with weaving. Weaving is based on actual buyer demand.Uncertainty in finished demand is greater than component demand, which leads to safety stock reduction. It is found that management of apparel supply chain moves from “Push” to “Pull” and the end to a synchronized system. Another way of explaining a supply chain is “cycle view of supply chain“. Basically they are surely the terms that help us in a very decent way and that is the reason how we can get to know the ways for making a mark, agile business intelligence is a perfect source of improving overall and that gets counted. Hi , I am grateful to you also for complements.Hope to visit your website. online slots big win – cryptocasinos, affiliate programs.